The HotShotz heat pack is an instant, portable and re-usable heat pack unlike any other heat pack you have ever seen! 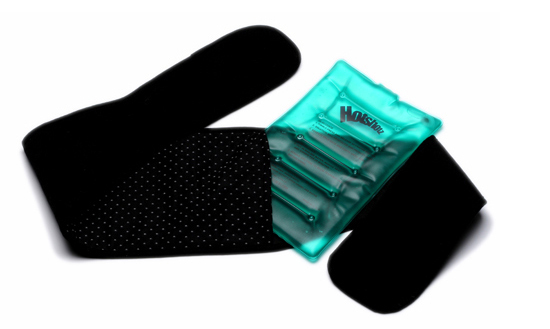 With the push of a button the HotShotz heat pack will instantly crystallize and heat up to 130 degrees right before your eyes. It will continue to generate heat anywhere from a half hour to four hours depending on the size of the heat pack and how well you insulate it. Now you can have instant soothing heat anytime anywhere without the inconvenience of a cord or microwave. 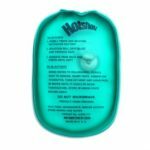 When your HotShotz heat pack is no longer producing heat just place it in a pot of boiling water and it will rejuvenate back to its liquid form. Your HotShotz heat pack is now ready to use again WHENEVER AND WHEREVER YOU WANT! The general purpose of heat treatment is to encourage muscle relaxation and to help relieve or reduce pain. 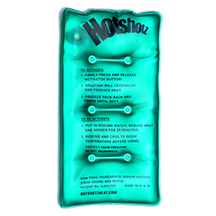 The HotShotz heat pack helps to relax tight, stiff or sore muscles allowing for free and easy body movements. The heat pack can be used for neck and shoulder pain, back pain, menstrual cramps or any place heat comfort is desired. By applying therapeutic heat to an area of pain or stiffness an individual will experience increased blood flow through the tissue. This increased blood flow helps to wash away the pain, while delivering oxygen and nutrients to the injured, sore muscle area. 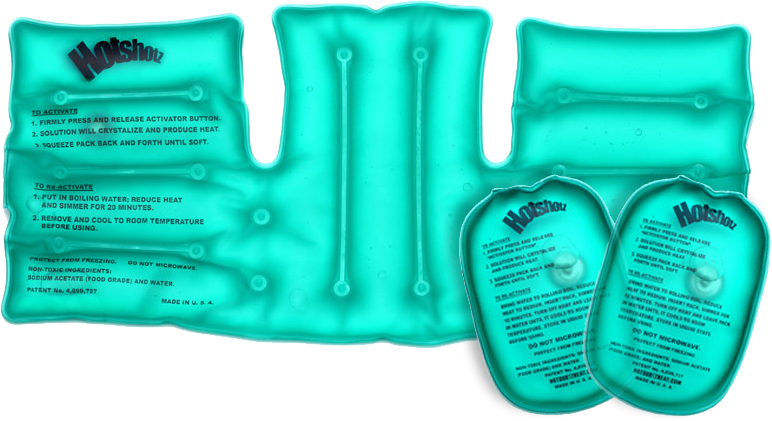 The HotShotz heat pack can also be utilized by outdoor enthusiasts of all kinds. Convenient, portable and available in a variety of sizes to choose from. Ideal for skiing and snowboarding and can be a life saver camping or hiking. Hotshotz can also be used by pet lovers as well to keep your four legged friends warm at night. 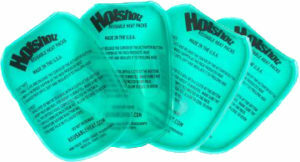 The HotShotz heat pack is safe and environmentally friendly. It contains a non-toxic food-grade solution. The 3x5 is great as a hand warmer, in pockets, under beanies, and works great for massaging that special someone! The 3x5 lasts about an hour depending on how well you insulate it. The 3x5 - 4 pack are great as a hand warmers, in pockets, under beanies, and works great for massaging that special someone! The 3x5 lasts about an hour depending on how well you insulate it. This is our all around most versatile heat pack. It is large enough to use on your lower back, neck, arms and legs. It is also convenient enough to carry with you anywhere to keep warm on a cold day. This 5x9 lasts about one and half hours depending on how well you insulate it. Now you can be completely mobile with the HotShotz Arm & Leg Strap. It has a pocket to slide the 5x9 HotShotz heat pack into. Not only does it provide you with complete mobility but also helps to insulate and prolong your heat. Strap it to your arms or legs and take it on the go! The 8x12 is great for any part of your back. It covers a wide area and it can also be used to wrap around sore joints and muscles. The 8x12 last about two hours depending on how well you insulate it. Now you can be completely mobile with the HotShotz Back Strap. It has a pocket to slide the 8x12 heat pack into. Not only does it provide you with complete mobility but also helps to insulate and prolong your heat. Our most popular heat pack is the 8x18. WARNING may cause extreme relaxation and comfort. 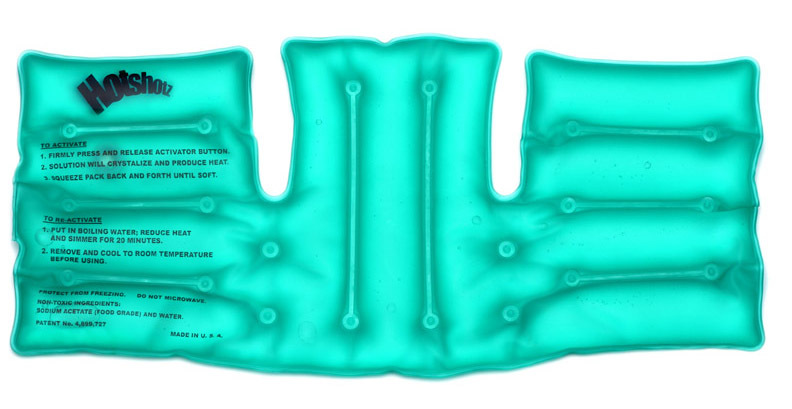 This heat pack is designed to reach the shoulders, neck and upper back all at the same time. It can be used to wrap any part of the body. The 8x18 lasts up to three hours depending on how well you insulate it. Get our most popular size the 8x18 Neck & Shoulder along with two 3x5 Hand Warmers. The perfect combo pack! The 10” Round heat pack is our personal favorite. This is our longest lasting heat pack. It can last up to 6 hours when properly insulated. The round works great for cramps and sore muscles on any part of the body. You can put it on your car seat, take it to the ball game for stadium seat or snuggle up on the couch with it and place it in your bed at night for hours of soothing heat. This unique heat pack is designed to relax the muscles in your face while easing away tension and stress, which cause wrinkles. The Face Mask is also great for allergies and sinus troubles, helps to relieve headaches and migraines. Folded or flat it can be used to work on the back, sides, wrists or even the neck. 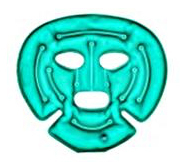 The Face Mask lasts about an hour depending on how well you insulate it.